I would love to see her make a White Chocolate Macadamia Nut Cookie. pomegrante delight! maybe throw in some chocolate? sounds good to me. I heart pomegrante AND chocolate. Vegan white chocolate chip and macademia nut!! Oh Yum!! I like chocolate oatmeal raisen cookies! Mocha cookies would be yummy. I love a good oatmeal raisin one, too. sorry about the earlier confusion. I’ll let my friends know that they must enter through their own comps. Thanks! Any cookie that my 4 year old son with multiple food allergies can eat is a wonderful cookie to me! His 11 month old brother also has food allergies so I would love to win these cookies. It’s so hard to tell a child he can’t have something because it will make his sick. With these cookies, at least he would be able to have some treats. My son LOVES your chocolate chip cookies! I would love to see a ginger sandwich cookie with a light lemon creme in the middle! Thanks! Snickerdoodles or ginger bread would be awesome! And she loves lemon flavor. Hmmm, I vote for snickerdoodle or PB chocolate chip! I think HomeFree should come up with oatmeal cranberry walnut cookies! Hi! I would like apple-cinnamon cookies with a soft apple centre. Chocolate almond would be good, thanks. Mmm… some kind that mimics a white chocolate chip macademia nut would be awesome!!! I would love to see a really decadent chocolate cookie with chocolate chips, toffee, caramel, and maybe even soybutter. Not really sure if you can make toffee without dairy, though??? 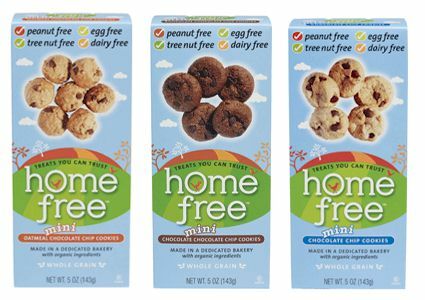 I want these cookies because they’re dairy free. I’d love to see an oatmeal raisin, a mint cookie(but not with chocolate) and a non-chocolate cookie with toffee bits in it! I second the Snickerdoodle!!! 😀 Or Chocolate cherry! I want them because we try to eat as much organic as possible and would love to try these. Maybe she could make a Butternut Toffee? There should be a white choco macadamia nut cookie. B/c that’s 1 of the best flavas evah. Something with coconut would be great. Maybe dates too. I would love to see chocolate mint cookies! Gingersnaps! Like the super thin ones. I think they should come up with a plain sugar cookie. Pumpkin always does it for me! Not sure if I’m too late for this or not. I’d like to see a good, safe vanilla sandwich cookie (vanilla wafers with vanilla cream inside). 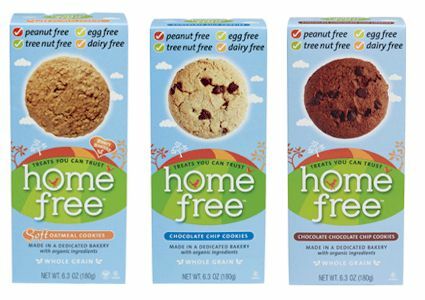 My daughter loves Home Free cookies and it is great to give her a treat with no worries! Your cookies look delicious and could not be improved upon–but since you asked, why not a pretty pink pomegranate cookie? Pomegranate is very popular these days. Thank you for the contest. Happy Mother’s Day! I would love gingerbread with raisins.